At Pear Stairs, we understand that you are not going to compromise on quality for the sake of cost. This staircase is something which you are going to live with for a long time (as will anyone you sell on to). That’s why we make our bespoke staircases from the very best quality timber: European or American White Oak; Ash; Hemlock; Southern Yellow or other pines – not to mention exquisite Walnut and Sapele (responsibly sourced, of course). Whatever look you are going for in your London interior, we have a warm, natural, tactile timber that will work with it. As for the design, the sky’s the limit. You may know exactly what you want – may have seen it in another house, or a magazine, perhaps? In that case, all you need to do is click on our information pages, which contain everything you need to design and measure up. Or you can browse through the stylish stairways in our Staircase Studies section for inspiration. 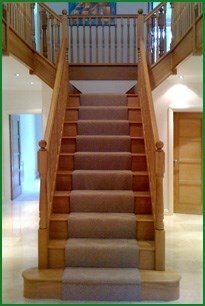 We are experts in stairs and will help manufacture the perfect staircase for your London home. We have easy-to-follow guides on key aspects, such as how to measure up and calculate the number of steps, and also clearly laid out construction drawings to guide you. What’s more – because we know technical instructions can be a nightmare to understand – we have included a comprehensive glossary of all the terms we use. Alternatively, you can take advantage of our expertise in staircase-making and let us handle this side of things for you. If you’re not looking for a whole new staircase - just to give a new lease of life to the one you already have – we can help there too. 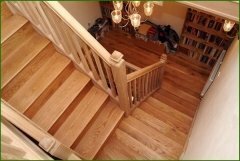 Here at Pear Stairs we make all of the individual parts of a staircase: from hand rails to balustrades; Beaufort spindles to newel caps; stringers; risers; bullnose steps and treads. 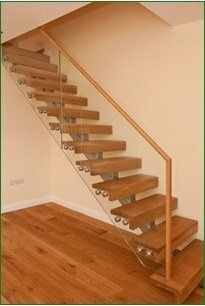 Whatever part of a staircase you could conceivably need, we make it; and all in a wide range of beautiful woods. Again, our website has clear instructions on how to replace those parts you might need to. Staircases are our speciality at Pear Stairs — and our passion. We have been crafting them at our workshops for over a century and we want to be the best in the business. Our customers tell us that we are. Have a look at our pages of testimonials (and comments next to the photos they have given us). Don’t just take our word for it. We deliver all around London and the UK and we are regularly complimented on the politeness and helpfulness of our delivery staff. Staircases take just 7-10 days to be delivered once you have confirmed your design drawing with us. Stair parts often take less time and are delivered by courier. Take the next step in styling and adding value to your London home, with a fabulous Pear Stairs staircase.